The Sumerians recorded Lugal as the star that stands in the breast of the Lion, Leo’s heart - the King. Our heart is the engine that drives the forces of our body. How we nourish our engine is shown in how we are conditioned. Moving with the heart of a lion we begin again. We choose to become a better version of ourselves, we begin to work with and from our heart found in our core. Functional movements follow the principle of core to extremity. All movements begin with a thought, moving our core, and guides our extremities, to express the beauty and virtuosity of movement. 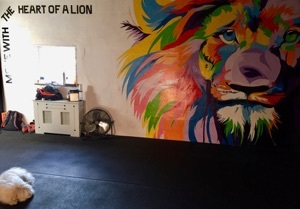 Through CrossFit we rediscover our lionheart to reach our potential and move with freedom.